Tired of telling your child they can’t wear the combination of clothes they picked out? 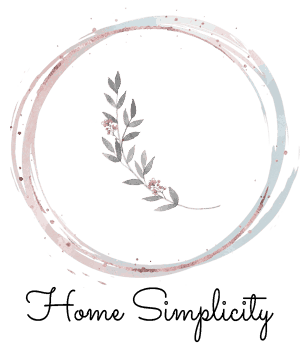 Maybe it’s time to make a Minimalist Capsule Wardrobe! Plus, how we store clothes without a dresser! A few weeks ago, our family experienced a “first”. One night before bed, my preschooler refused to wear the pajamas I selected for her. A total normal developmental milestone, but one I wasn’t totally prepared for! And it got me thinking about the capsule wardrobes I’ve created for her up until now. We’ve been blessed with a great deal of hand-me-downs and I am so thankful for them. 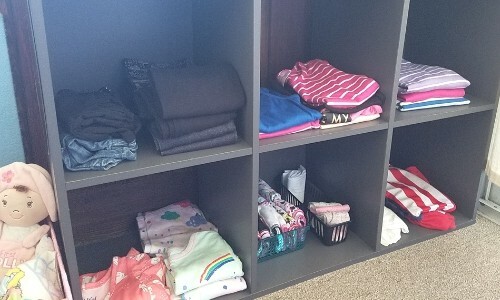 However, they aren’t easy to incorporate into minimalist wardrobes, and they often come with a lot of various colors and patterns that don’t work well together–making it really stressful to get a young child dressed. That night I tossed and turned in bed. What if my daughter had a “uniform” that would make getting dressed easier? What if she could pick her own clothes and they would almost always match? It’s probably unrealistic for every single piece to work together, but if the majority that you have within your child’s reach fit the criteria, it will dramatically simplify life, and reduce conflict. Another bonus, it will likely reduce the time it takes your child to get ready for the day! In the past, I focused more on the number of clothing we had than the versatility of clothes. This was mostly because of the hand-me-downs we’d received, and also because I had a slight clearance rack addiction. Clearance sounds like a great deal, but usually, it’s not, so start placing limits on yourself and go into stores less! Needless to say, my daughter’s previous capsules were “working” but not ideal. And up until now, she has always worn what I put on her. But that’s changing, and with it, I realized my strategy needs to grow with her. To foster her independence, I’m intentionally creating her Spring and Summer capsule to be completely different. We have a few hand-me-downs in our collection, but I have only included the ones that work well. The rest of them will be passed on to other families who can love and use them. As a parent, there is a fine line of guiding and directing our children and controlling them. I want my child to learn how to make good decisions and express herself in healthy ways, but she also needs my input and encouragement to do that. Parenting styles differ, and it’s important to remember that minimalism will look different for each family. 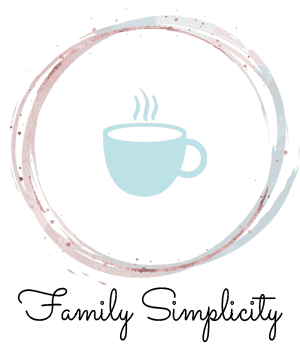 This is not about deprivation and lack. 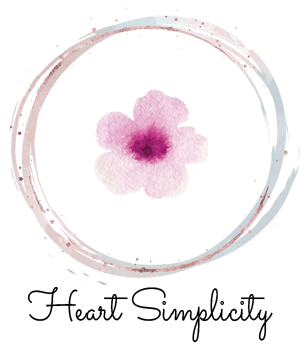 It’s about simplifying and streamlining so we can enjoy life and experience more. With that in mind, I have chosen to create a basic palette for my daughter to explore and create with. Some people pick a particular color scheme for the seasons and I think that’s great. Some incorporate more patterns and designs, some stick with all plain colors. Those elements aren’t as important as picking something that works for you and your child. I will not force my child to wear clothing that she doesn’t like or finds uncomfortable. I will also not cater to her whim if she desires to wear something that is seasonally inappropriate. There is a balance! I thought extensively about what kind of “uniform” I could create for her that would not be restrictive, but would also keep things simple. In the end, I chose basic bottoms that go with all her tops to keep things simple. Some people love bright wardrobes and colors. I’m not a huge fan, as I prefer neutrals, darks that wear and wash well and pops of accent color and pattern. My daughter is in preschool and is just starting to have opinions of her clothing, so that will be taken into account more and more as she grows. 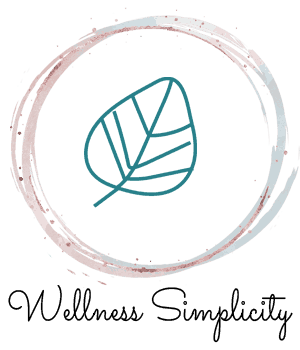 There are many choices for shopping for a minimalist kids wardrobe, but I’ve found it’s far easier to stick with 1-3 brands or stores than to piece together multiple brands. One of the biggest problems I’ve encountered trying to do that is the size difference between brands. Within one labeled size you will find a vast difference in lengths and fits, so sticking with just a few favorites has dramatically simplified things because I know what size will work and she’ll be able to get the most wear out of her clothes. Since we have a budget to stick to this season, we chose the cheaper Cat & Jack leggings (in black and dark blue jegging) from Target, and pants and shorts that were collected in previous years from clearance racks. I also chose Cat & Jack pajamas that were on sale online. I chose to spend the majority of our spring/summer budget on one Hanna Andersson order, and shopped one of their spring sales, plus added on first-time order discounts. 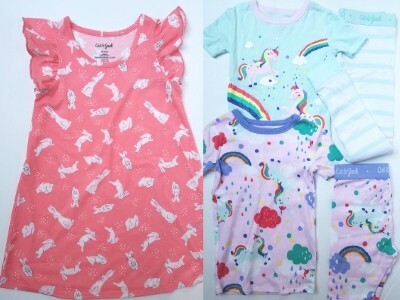 While this was my first order, we have been graciously handed down several Hanna Andersson dresses and pajamas over the years and love the lasting and durable quality. 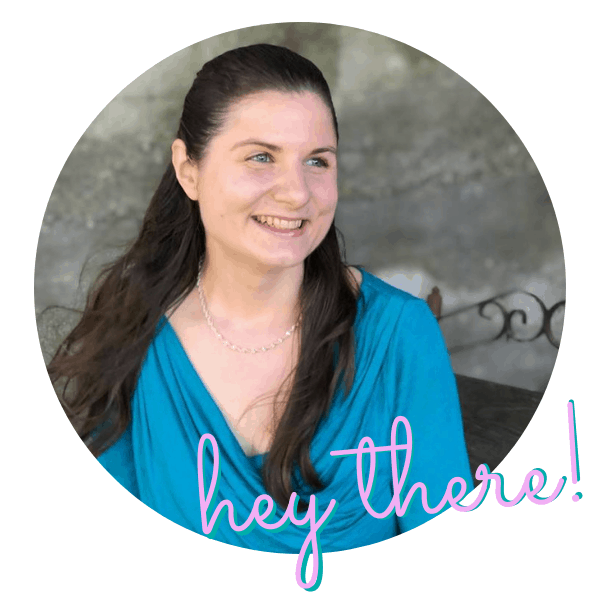 In the future, I also want to explore Primary.com as their prices are a little more affordable, but their fabric is still OEKO-Tex Standard 100 certified (that means no nasty chemicals). I’ve heard great things about their quality as well, so we’ll be trying that out next. While it’s important to stick within your budget for a capsule wardrobe, it’s also wise to think about the durability and fabric of the clothing you’re choosing. 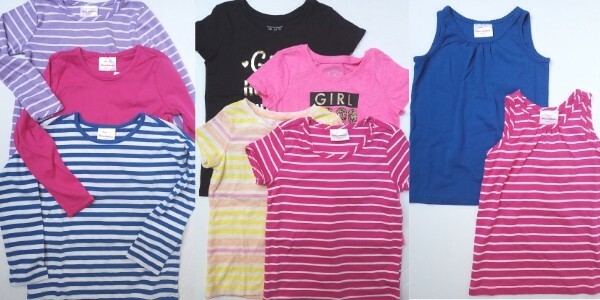 High-quality clothes are more likely to last for multiple children, or have good re-sale value. 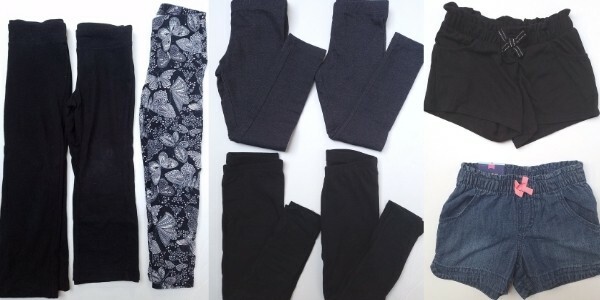 2 black leggings, 2 dark blue jeggings, 2 black pants, 1 patterned legging, 2 shorts. In the future, I would not purchase patterned leggings, but as I said, I had a bit of a clearance problem in the past. Since spring and fall have chillier days, I have kept a few long-sleeve shirts in her capsule, so these clothes will take her nicely from spring into summer and then into fall. Your weather will determine exactly how many of each type of top. 3 long sleeve, 4 short sleeve (at this time, but that number may increase), 2 tank tops. The long sleeve will be put away during the heat of summer, but will serve us still in spring and fall as the seasons transition. We’re starting with 5 dresses hanging in the closet. 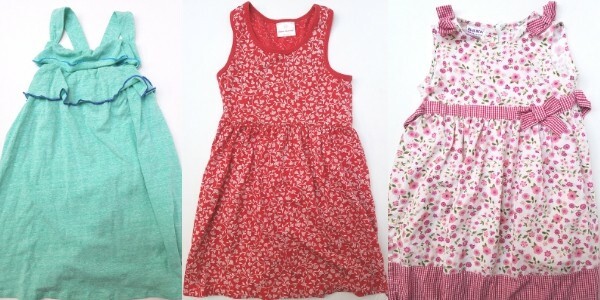 I purchased 2 new from Hanna Andersson, got 1 on clearance at Target awhile back and were handed down 2 more sundresses, 1 of them also being Hanna Andersson. My daughter usually wears dresses to church each week and enjoys wearing them around the house too, so for us, having 5 is perfect. I purchased one Cat & Jack swimsuit on clearance last year and that will last her through the summer. I went with a set of mix and match Cat & Jack PJs from Target. A simple nightgown and a PJ set with 2 short sleeve shirts, 1 short, and 1 pant. That’s plenty to rotate through cooler and warmer nights. 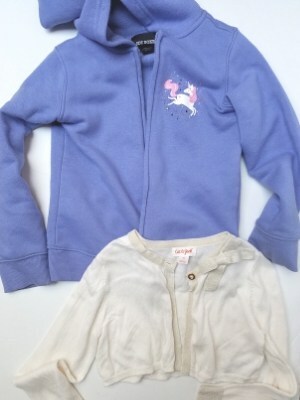 She has one zipper hoodie sweatshirt and also a lightweight cardigan sweater for church. I typically buy one pack of socks per size, so right now she has 6 pairs of socks and 1 pair of tights. She has 2 pairs of shoes–sneakers and dress shoes, though we will be buying a pair of sandals for summer as well. I keep one small bin of play clothes in her closet on the top shelf. Not everyone chooses to do this, which is totally okay! I tend to stress about stains and damage to nicer clothing, so when I know she’s going to be digging in the mud or doing artwork that could stain, I’d rather put her in an outfit that’s seen better days. Typically I keep 2 pairs of pants or shorts and a couple shirts for her. These also serve well as “emergency change” clothes to keep in my purse or backpack when we’re out of the house. I’ve heard many well-known minimalist moms claim their secret is doing laundry every day. For some, this may work well, but for me it does not. We choose to line dry our laundry, which means we’re limited by space. Also, being in a small home means our washing machine is close to the bedroom so I can’t run loads when anyone is sleeping. All that to say, I usually do laundry 3 times a week, and sometimes hand wash delicate clothes in the tub. I’ve found that the number of clothing items we have works well with this system, and I don’t think it’s necessary for our family to have fewer pieces of clothes and do laundry more often. If that works for your family–fantastic! But this works for us! We currently store all our clothing without dressers. Now, I’m not against dressers–we just don’t own one. What we do have is a 6 cube organizer that was initially purchased for my daughter’s minimalist Montessori toddler bedroom, where it housed a few favorite toys. We moved and downsized our home, and the cube ended up in her new playroom, where I used fabric bins for her clothes. However, I really didn’t like that because her clothes started to develop a musty smell from the bins and clothes were just tossed in a pile. 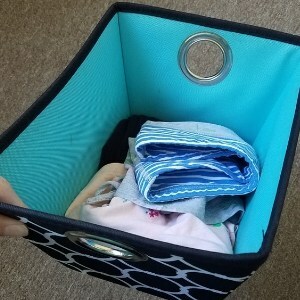 When I started KonMari folding, they looked better, but there were still buried at the bottom of the bins, which didn’t foster my daughter’s independence. Finally, I decided to ditch the bins, minimize her wardrobe again, and fold on the shelves. Since her clothes are minimal, it doesn’t bother me if she pulls them out and they need re-folding. But so far, that hasn’t been much of an issue. 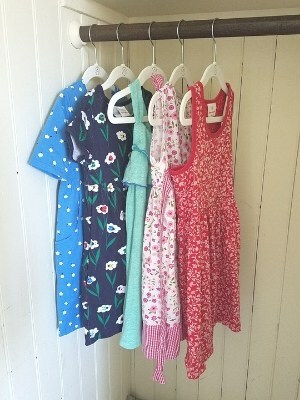 In the closet we have one set of 5 Kid size Huggable Hangers, and her 5 dresses hang there. 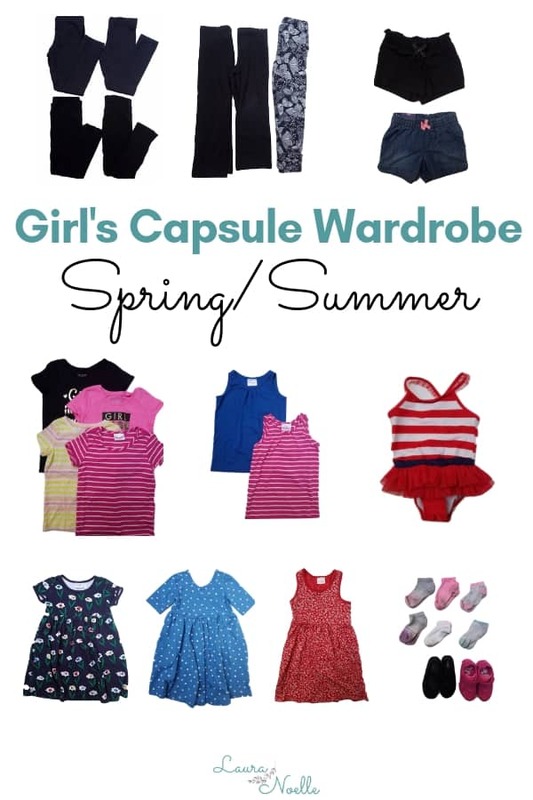 Having a kid’s capsule wardrobe eliminates the need for clothing wars. You can end them by ensuring that all the options on the shelves or in the closet actually go together and are seasonally appropriate choices. I liked your six cube bin idea the best. I often use cloth hanging bins (hung from closet rod) with four bins. They are very versatile. 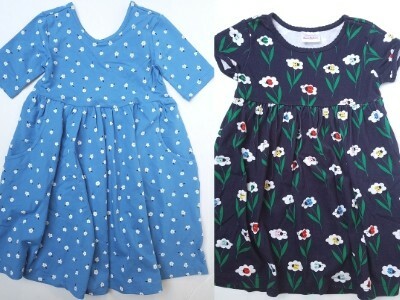 Gee, I wish my wardrobe was as nice as your little girls when I was little! Thank you, Kathleen, that’s very sweet! Hanging bins does sound like a good idea too!